To understand why the conflict between Israelis and Palestinians persists today, we need to understand its root causes. The Rejection of Palestinian Self-Determination deconstructs numerous historical myths with incisive reanalysis of key events during the post World War I Mandate era, illuminating how Israel was created through the wholesale violation of the rights of the Palestinian people. Hey! 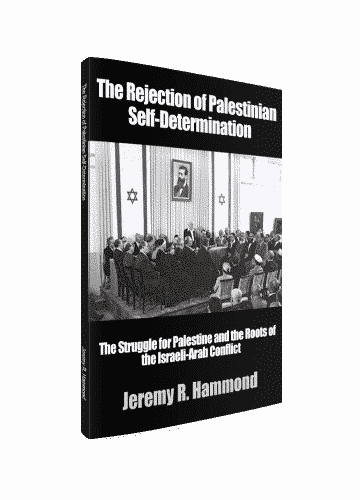 I’m Jeremy R. Hammond, the author of the book The Rejection of Palestinian Self-Determination. I was unsatisfied by the absurd answer from the government that it was because “They hate our freedom!” This transparently disingenuous assertion made me all the more curious to learn the true reasons. And so I began a journey of discovery, researching US foreign policy in search of answers. It didn’t take long to start finding them. With the internet at my fingertips, my pursuit led me to understand just how atrociously harmful US foreign policy has been in the Middle East, and my pursuit naturally led me to focus on the conflict between Israelis and Palestinians. The oppression of the Palestinians was, of course, one of the grievances cited by the alleged perpetrators of the 9/11 attacks. But I also had another reason for my interest in the issue. Although I am no longer religious, I was raised as a Christian and frequently exposed to the view that the US must support Israel because the Jews are God’s chosen people. Indeed, many Christians believe that the establishment of Israel in 1948 is was a fulfillment of prophecy. I never subscribed to the view that the US should support Israel’s policies toward the Palestinians, who were so obviously oppressed under a military occupation regime. 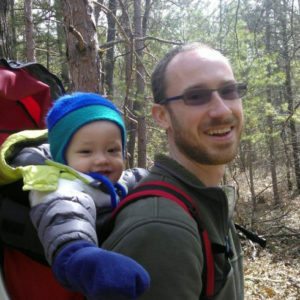 I also struggled with numerous other beliefs of the Christian religion, and at that stage in my life, I was also on a journey of essentially deprogramming myself from various forms of indoctrination, including church and school. But that background also instilled in me a great interest in Israel and Palestine. I spend the next several years deepening my knowledge of US foreign policy and sharing what I learned with others. By late 2002, I was writing mass emails to family and friends warning that the government was lying about Iraq possessing “weapons of mass destruction” in order to start a war for regime change. In early 2003, I started my first website to share my writings with others, and in 2008, I launched the online publication Foreign Policy Journal. That winter, Israel launched a major military assault on the Gaza Strip. I was writing about it, including about how the US was supporting war crimes against the Palestinians, which led to me receiving a Project Censored Award. Maddened by the blatantly propagandistic mainstream media reporting about that Israeli operation, I also became determined to write a book about it to set the record straight. But I didn’t just want to tell about the siege of and assault on Gaza. I wanted to tell the story of how the US was complicit in the oppression of the Palestinians, including war crimes. And to tell that story, so much more context was needed! That book idea was eventually realized when I published Obstacle to Peace: The US Role in the Israeli-Palestinian Conflict in 2016, which focuses primarily on US policy since the 1980s, and especially the eight years of the Obama administration. However, in the process of writing that book, I realized I would need to provide readers with historical context so they could truly understand more contemporary events. This led me to splintering my book idea, and so in 2009 The Rejection of Palestinian Self-Determination came to be. To write it, I set out to further research the origins of the conflict, particularly by more closely examining key historical documents I was really only familiar with from what I’d read about them. I was astonished by what I learned reading those texts for myself, as opposed to the characterizations and interpretations of them I was familiar with. There were also key pieces of information I found in these documents that I was shocked I had never read before! How could so many people write so much about this issue and yet these critical pieces of context were simply not part of the story that the public was being told?! The conflict is unsolvable because there is an inherent enmity between Arabs and Jews, who had always been in conflict with each other in Palestine. During the Mandate, the outbreaks of Arab violence against Jews was a result of the Arabs’ inherent hatred toward Jews, whom the Arabs just didn’t want to live with as neighbors. The British government’s famous “Balfour Declaration” granted legal authority to the Jews to have a state of their own within the larger area known as Palestine. The Jewish community acquired the land in what would eventually become the state of Israel by legally purchasing it from the Arab landowners who had until then its rightful owners. The United Nations in 1947 partitioned Palestine into separate Jewish and Arab states, but whereas the Jews accepted this reasonable solution, the Arabs rejected it because they refused to accept Jews exercising self-determination in any part of Palestine. The UN “partition plan” resolution, Resolution 181, granted legal authority to the Zionist leadership for their Declaration of Independence on May 14, 1948. A manifestation of their rejection of Jews’ rights, the neighboring Arab states invaded the new state to wipe it off the map. The Palestinian refugee problem that still exists today is a consequence of this Arab aggression. Every single one of those above statements is a myth. In my book, I explain why each of these popular beliefs are more fiction than fact, with a particular focus on re-examination of key historical documents that you’e probably heard of at one point or another, but the real significance of which never seems to be communicated. Its a fairly quick and easy read, but it’s packed with important information and unique insights that will illuminate for you the true origins of the conflict. In short, in this book, I show how the root cause of the conflict that persists today is the rejection by the Zionists, the British, and other Western powers of the right of the Arab Palestinians to self-determination. What Others Have to Say about The Rejection of Palestinian Self-Determination. 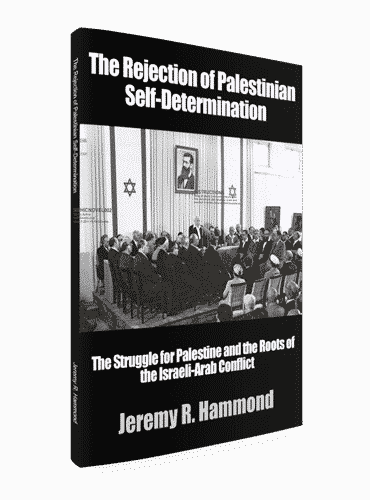 For such a small book, ‘The Rejection of Palestinian Self-Determination’ by Jeremy Hammond is a mine of information. This is a revelatory work that brings amazing clarity to a completely obfuscated situation…. I think you are the Chomsky — the original source of my Palestine interest — of your time. Excellent reading, with well sourced information, Jeremy Hammond never fails to impress. A soul searching unbiased book. Very informative. Mr. Hammond did an excellent job. His book is precise and to the point. I highly recommend it for anyone seeking information on the Arab/Israeli conflict. Well. I just completed reading… And quite frankly now I am ready to be the next secretary general of the United nations…. Mr. Hammond, you have woke me up…. Many of us need the plain truth before getting involved and you are doing a great job about it. Like all of Jeremy R. Hammond’s work, this book is thoroughly researched. Though small, it contains a great deal of information. Sources are listed if further reading is required. There can be no resolution to the Palestinian-Israeli conflict without understanding its root causes. I hadn’t realized the degree of deception, incompetence and complicity of both the UK and the USA in the denial of the fundamental right to self-determination of the indigenous peoples of Palestine. 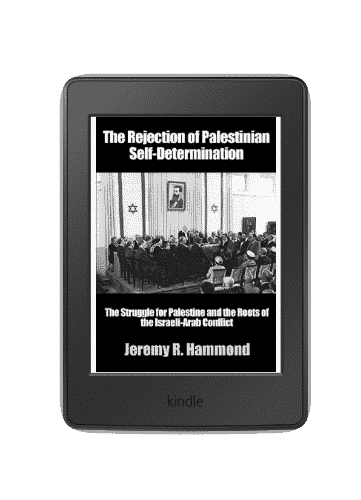 The Rejection of Palestinian Self-Determination is available in paperback, PDF, and Kindle editions and at 75 pages is a fairly quick and easy read, yet economical in delivering a great deal of important information helping you to understand the true origins of the conflict. I’ve written a number of books on the Israel-Palestine conflict. My major work is Obstacle to Peace: The US Role in the Israeli-Palestinian Conflict, which is an essential read. Rejection serves as a great short primer and companion volume, helping you to more fully understand the historical origins of the conflict in order to better understand the more contemporary events covered in Obstacle to Peace. My most recent book on the subject is Exposing a Zionist Hoax: How Elan Journo’s “What Justice Demands” Deceives Readers about the Palestine Conflict, which draws on some of the information in Rejection, but also compliments this earlier work since each delivers knowledge not covered by the other about Mandate-era Palestine. Reading them both will give you a very well rounded overview of the origins of the conflict. I’ve also published a short book titled Benny Morris’s Untenable Denial of the Ethnic Cleansing of Palestine, which is another great companion volume, since I only briefly touch on the ethnic cleansing in the final chapter of Rejection. I recommend reading Rejection first, then Benny Morris’s Untenable Denial. After that, read Exposing a Zionist Hoax and Obstacle to Peace in any order. Prefer to Buy The Rejection of Palestinian Self-Determination Individually?